This scene shows the Oba (king) with two of his royal chiefs kneeling before him. The scene suggests a swearing in ceremony of two new chiefs by the Oba. This ceremony is a whole community affair and on this occasion, Portuguese visitors are among the spectators. The demure of one of the Portuguese visitors shows that he is intrigued by the ceremonies. The chiefs are fully clothed in their coral beads regalia, confirming that the occasion is an important as well as expensive one for the chiefs. We can tell the stage in the ceremony as the chiefs do not yet have their ceremonial emblems of duty- the Eben. They will get this when they have been fully cleansed and initiated and which will empower them to begin to exercise their authority in the community. This plaque shows a victorious king after a war in a cerebration scene with the whole community. The bronze caster cleverly tells a compelling narrative by the number of characters he chooses to include in the plaque. The king takes central position and leads his warrior chiefs and other soldiers in the procession just as he would have done during the war. The warrior chiefs are the same size as the king to show that they were all of equal importance during the war as team effort was required to be victorious. The bronze caster includes the musicians as smaller figures with blow horns and shakers to portray the community celebration of the army's victory. One can only imagine what a joyous occasion each victory in war was to the community and the celebrations that took place afterwards. 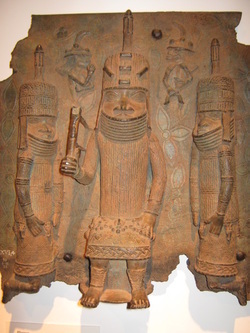 Just like the Roman Emperors had their arches and columns which celebrated their triumphs, so did the Benin Kings and royalties with their bronze plaques; same concept, different locations. This ivory work captures the Portuguese mission around the coast of Africa. Trade and conversion to Christianity. The Portuguese came in ships carrying their trading goods and their missionaries. The ship and masts can be clearly seen. Underneath the ship is the trading goods container and beneath this are the traders and the missionaries. This priest carries a spear and sword and wears a big rosary. His mission is very clearly conversion of the indigenes to Christianity. 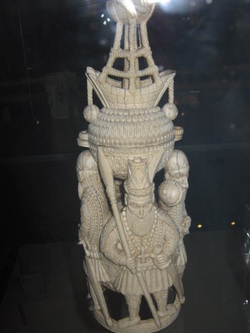 The Benin Kingdom collection of artwork capture important moments in history for posterity; well worth preserving and studying by all scholars and people; not least for the message of industry, creativity and resourcefulness; these were strengths of the Kingdom of Benin kings.